Different people want different things from their Shakespeare. Some want it modernised, the eternal appeal of the bard twisted into sharp relief by some cunning, beard-stroking 'still true to this day, innit' resonances. Others like an abstract Will, all context removed along with the scenery and any distinctive costumes. Some like their Shakespeare quaint; in the park, back in 1940s cricket whites and boaters. Earlier this year, London hosted a gorgeous South Asian Shakespeare in the RSC’s multi-lingual Midsummer Night's Dream at the Roundhouse. With all this imagination and innovation going on, there’s not much for the traditionalists out there. Those who like their Shakespeare straight-up, a no-frills pint of ale against a modern quirkily-named cocktail adorned with fruit and umbrellas will no doubt love this season's Othello at the Globe. Part of the theatre's Renaissance and Revolution season, this is a straight-forward, safe, schoolish rendition of the play. Swords, doublets and knee-high boots for the boys; gorgeous late-Elizabethan corsetry for the girls. Traditional instruments and music complement the traditional costumes, and the scenery is similarly matched. Which leaves us, thrillingly, the bare bones of plot, words and actors to entertain us. And within these traditional boundaries, they certainly do. Othello, you'll remember, is different from Shakespeare's other tragedies. There aren't any odd ghosts or witches to blame for the breakdown in what's right and wrong. Our hero’s not a barmy old bloke, or a headstrong teenager. The sad thing about Othello is he’s guilty, as he says, of loving ‘not wisely but too well’. An outsider in a position of authority, he's praised for his free and open nature, but once Iago, the jealous, plotting forerunner of many a modern pantomime villain decides he’s going to wind Othello up over his new wife’s fidelity, there is little our hero can do to escape his terrible downfall. 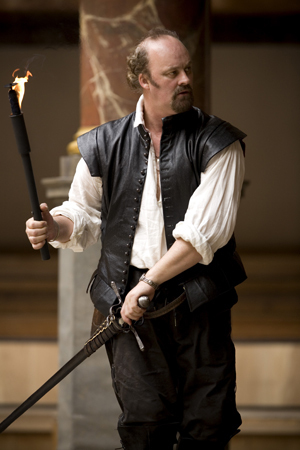 Iago is one of theatre’s greatest baddies. We were slightly concerned to learn that Tim McInnery was to play the role – Blackadder’s Lord Percy and Captain Darling playing one of the vilest villains known to stage? Whatever next? In fact, McInnery steals the show, as Iagos should. A misogynistic, manic manipulator, McInnery’s Iago twitches with near-madness through his soliloquies, explaining his wicked intentions to the audience with perfect delivery, making us complicit in his crimes. His mood turns on a glance. Even when the play is over, McInnery’s curtain call is restrained, leaving us wondering if playing the ‘demi-devil’ is taking its toll on one of our finest actors? Easily matching Iago’s stage-presence are the women in the show. Women seem to fare well at the Globe, perhaps something of the ancient acoustics (ironically) favours their voices. Zoë Tapper as Desdemona and Lorraine Burrows as Remilia shine with an intelligence and dignity sometimes frustratingly absent from Shakespeare’s heroines. Dignity flows through Eamonn Walker’s Othello too. In earlier scenes, he more than proves his worth as a charismatic leader, suitor and subordinate to the court. Later, his tragic near-madness is genuinely moving. His huge physical presence on stage unfortunately isn’t matched by his vocal range, and as we were sitting in the top tiers, some of his words were lost, which is a shame. We’re worried his voice might not last the run. But purists understand that the Globe is a challenging place for modern actors, and forgive the flaws, or the occasional lost line. Be warned, though. The other challenge in this play is the length. At over three hours, you need to be an absolute fan to stand with the groundlings. If you've got a seat, don’t be shy about securing yourself a cushion. Traditional can mean uncomfortable too. Quibbles over time aside, this is a steady, safe show. However, if you think traditional is synonymous with boring, and you're looking for the next modern twist or a grand reinterpretation of the bard, this might not be for you. Othello by William Shakespeare, 24th May-19th August, Shakespeare’s Globe, for more information go to The Globe website. Tickets £5–£32.